3 Bedroom Detached House For Sale in Bolton for Offers in the region of £675,000. Set within approximately 18 acres of land, this fantastic property must be seen to be appreciated. 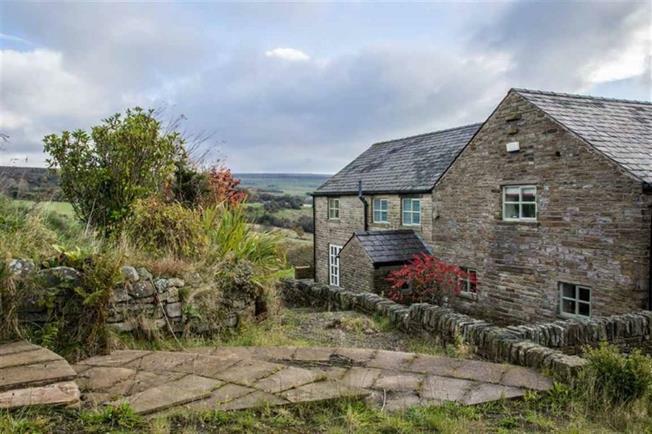 This detached farmhouse occupies a peaceful position with far reaching views over surrounding countryside. Beautifully presented, Cote Farm dates back to the 1700's when it started life as 2 stone cottages and a barn. The property was extended in 2002 and was totally renovated including the new Welsh slate roof. There is further potential to extend the current accommodation into the attached barn as planning permission was granted for a large reception to the ground floor and three rooms plus en-suite upstairs. Internally there are three bedrooms with en-suite and dressing room to the master bedroom to the first floor and three reception rooms and fitted kitchen/breakfast room to the ground floor. Internal inspection is highly recommended. Wooden front door. Double aspect double glazed wood windows facing the rear and side. Carpeted flooring, built-in storage cupboard, beam ceiling, ceiling light. Wooden French, front and back double glazed door. Double glazed wood window facing the side overlooking fields. Carpeted flooring, ceiling light. Double aspect double glazed wood windows facing the rear and side. Underfloor heating, tiled flooring, beam ceiling, downlights. Granite effect work surface, fitted and wall and base units, belfast style sink and double sink, space for, freestanding, range oven, over hob extractor, integrated dishwasher. Wooden stable . Underfloor heating, ceiling light. Double glazed wood window facing the rear. Underfloor heating, tiled flooring, ceiling light. Fitted and wall and base units, belfast style sink, space for washing machine, dryer. Double glazed wood window facing the rear. Tiled flooring, ceiling light. Low level WC, wall-mounted sink. Wooden stable . Double glazed wood window facing the side. Stone flooring, built-in storage cupboard, ceiling light. Wooden French double glazed door. Tiled flooring, ceiling light. Wooden French double glazed door. Underfloor heating, carpeted flooring, beam ceiling, ceiling light. Double glazed wood window facing the front and side. Radiator, carpeted flooring, wall lights. Double bedroom; triple aspect double glazed wood windows facing the front and side. Radiator, carpeted flooring, downlights. Tiled flooring, downlights. Double enclosure shower, vanity unit and inset sink. Double glazed uPVC window facing the rear. Radiator, tiled flooring, downlights. Low level WC, spa bath with mixer tap, double enclosure shower, vanity unit and inset sink with mixer tap. Double glazed wood window facing the rear. Radiator, tiled flooring, fitted wardrobes, downlights. Double bedroom; double glazed wood window facing the rear overlooking fields. Radiator, carpeted flooring, ceiling light. Double bedroom; double glazed wood window facing the side. Radiator, carpeted flooring, ceiling light. Double glazed wood window facing the side overlooking fields. Radiator, tiled flooring, wall lights. Low level WC, panelled bath with mixer tap, single enclosure shower, pedestal sink with mixer tap.